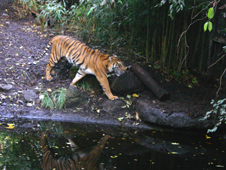 The Royal Melbourne Zoo is a great attraction only minutes from the city. Narrow winding jungle paths lead you through different bioclimatic zones and landscapes such as African and Asian Rainforests and the Australian Bush. These small paths make the zoo seem much larger than it really is. The Zoo is located in Royal Park - a huge stretch of parkland only 4km from the city. As you step through the Art Noveau entrance that breaks up its surrounding brick wall, you are immediately in another world. Melbourne Zoo was established in 1862, in the heydays of Melbournes settlement, to acclimatise introduced animals - which people brought for their survival - to the harsh Melbourne weather. But it quickly became a zoo with animals to look at. There is a spacious Victorian garden with an abundance of trees arranged around geometrically designed paths and picnic grounds. From there a web of intricate pathways leads off into the nooks and crannies of the different environments. Animals are kept in sweeping natural settings that have replaced the outdated brick and bar 19th century approach. You walk along pacing Sumatran Tigers in dense bush, and then meet the Asian elephants on their trail along a jungle walkway. There are impressive large Brown Bears, a group of Gorillas and Orang-Utans, Red Pandas, Snow Leopards, Tree Kangaroos and the very cute native Little Blue Penguins. 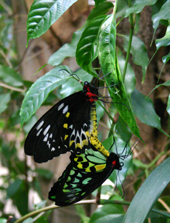 A favourite is the butterfly house, where thousands of butterflies flutter through the large tropical space, landing next to or on you  a magical place. There are Close-up Encounter experiences that will bring you even closer to the animals, as well as Roar n Snore experiences, where you can camp out and experience the wildlife at night. During summer weekends the Zoo is venue to popular twilight concerts. 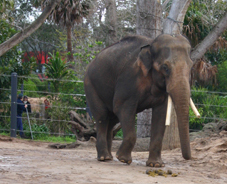 The Royal Melbourne Zoo is popular with Melburnians. Many families have yearly passes and make it a regular destination for their family outings. 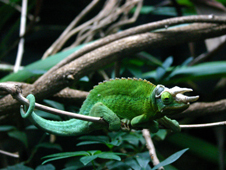 You can get into this zoo much cheaper with the Melbourne Sightseeing and Attraction Pass. This is available for short stay tourists, and also for locals who can visit five Melbourne attractions at much reduced rates over a 3 month period. From mid January to mid March the zoo has Saturday and Sunday twilight concerts. You bring your picnic rug and hamper or buy food there, while listenting to popular tribture bands in the ambient zoo setting. You need to purchase special tickets at www.zoo.org.au. You get to the zoo with the #55 tram from Williams Street, or on the Upfield train (get off at Royal Park Station). There is also a large car park.